Unlike any other reference, Handbook of Manufacturing Processes is an in-depth compilation of the workings of more than 1500 different manufacturing processes in metalworking, chemicals, textiles, plastics, ceramics, electronics, wood and food industries; as well as how more than 600 important products, components, materials are made. Logically organized in two sectionsa process section and a products sectionit describes clearly and succinctly the operations performed in the worlds factories. Heavily illustrated, it is a comprehensive source of technical manufacturing information that manufacturing engineers and managers, process engineers, and anyone who has an interest in or needs to know about manufacturing operations and products will not easily find anywhere else. Features practical, understandable explanations; even for complex processes. 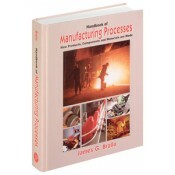 Includes clear descriptions of how each of 1500 current and recently developed manufacturing processes work, what they do to the material or workpiece that is worked on, what the results are, and where these processes are used and why. Explains how 600 products, components or materials are made; including nylon, gasoline, decaffeinated coffee, semiconductors, stainless steel, lasers, and many more. Codes text entries in a format that utilizes outline designations carried through to the accompanying illustrations for easy reference. Groups related processes together and covers sequential operation in order. Includes little or no mathematics.